Oral surgery encompasses some extremely common procedures associated with dentistry. They can help improve functional or aesthetic issues or both. In this blog, the oral surgeons at Dental 365 share what you need to know about oral surgery. Oral surgery is an area of specialty within dentistry. It involves the diagnosis and surgical treatment of diseases, injuries, and defects of the face, mouth, teeth, and jaws. Procedures are performed by an oral surgeon, who receives extensive educational training, including a minimum of four years in a hospital-based surgical residency program. Bone grafting - Dental implants or other restorative devices can be used in areas where one or more teeth have been lost, but they’ll need sufficient bone material in order to be placed. If you don’t have enough bone, bone grafting can be used to build up this material so an implant or other devices can be placed and properly supported. Wisdom tooth removal - Wisdom teeth can cause several issues when they come in. They sometimes become impacted and fail to fully erupt or can also cause other teeth to become crowded. These teeth can also be difficult to clean properly and can make adjacent teeth difficult to brush. Sometimes your oral surgeon may recommend that your wisdom teeth be removed in order to avoid gum disease, appearance issues, and other problems. Soft tissue grafting - Gums can recede and expose tooth roots, which can cause pain. This condition can also change the appearance of your smile. Soft tissue grafting uses healthy gum tissue to cover exposed roots, which alleviates pain and to thicken the rest of your gum tissue, which helps keep them from receding more. 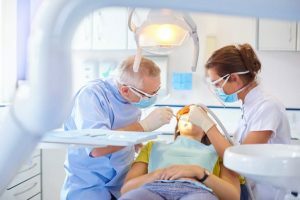 Tooth extraction - Dentists usually make every effort to save a tooth, but sometimes this isn’t possible due to extensive injury, trauma, or decay. In this case, a tooth may need to be extracted, or pulled, to improve your oral health. What is involved with oral surgery? Before your procedure, your dentist and oral surgeon will explain what the goals of your surgery are and what you can expect. During surgery, you’ll receive local or general anesthesia to help make you more comfortable. If you receive general anesthesia, you’ll need someone to drive you home. Your oral surgeon will also make sure you understand any aftercare instructions, including what you can and can’t do for a short period of time, what to do if you’re experiencing pain, bleeding, or swelling, and more. A follow-up appointment may be scheduled if necessary, and if you have any questions or concerns in the meantime, you shouldn’t hesitate to call your oral surgeon’s office. If you need oral surgery, contact Dental 365 today. We have offices conveniently located throughout the New York area, and our experienced oral surgeons are dedicated to providing the highest level of compassionate care to each patient. And if your problem is a dental emergency, we’re available 365 days a year.